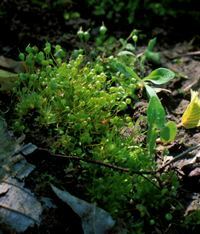 Mosses, liverworts, and hornworts have not been studied as much as vascular plants. However, there is some information available and some interest in the group in Iowa. This group of non-vascular plants is collectively known as byrophytes. H. S. Conard published a list which included 358 species. The reference is: Conard, H. S., 1956. 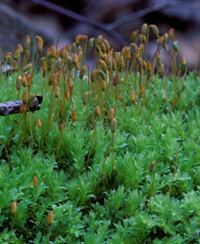 “Mosses and liverworts of Iowa”. Proc. Iowa Acad. Sci. 63: 345-354. That reference did give ranges verbally but did not have range maps. Mr. Conard also published a field guide, How to Know the Mosses and Liverworts. The second edition of the book, revised by Paul L. Redfern, Jr. may be currently available. It is published by WCB/McGraw Hill, copyright 1979. In 1978, James H. Peck wrote a paper which updated Dr. Conard's nomenclature and which had range maps rather than the verbal descriptions of the ranges. 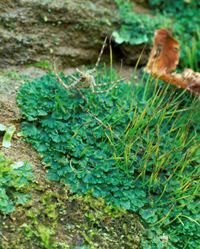 Mosses and liverworts can be every bit as fun to locate as some of the most spectacular wild flowers. If you examine them up close they have almost as much color and can have strange, exotic-looking structures. Their appearances can change seasonally and with different amounts of moisture as well. Some of our local botanists have started to study the bryophytes, and maybe some of the amateur naturalists will follow suite.